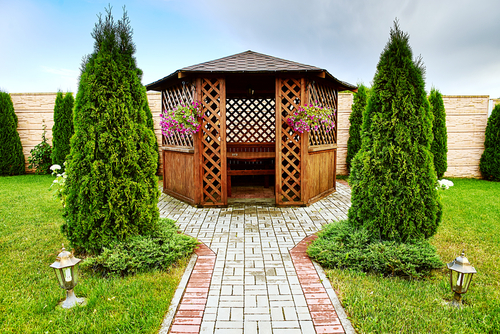 If you’re looking to improve your outdoor space, a pergola or pavilion may be the perfect option for you! Both pergolas and pavilions act as an outdoor space that can be used for entertaining, relaxing, and so much more. While the two designs are similar, they have some important key differences to note. Once you understand those differences, you can begin designing the perfect pergola or pavilion for your home! A pergola is an outdoor structure with a focus on architectural appeal thanks to the open roof design that allows you to see the wooden beams holding the structure together. To add more shade and privacy to your pergola, consider adding a creeping vine that will grow around each of the exposed beams. If you’re looking to make the pergola even more private, hanging outdoor drapes around the perimeter is a nice touch some people choose to utilize. Built-in lighting or chandeliers can be installed in the pergola to offer a more elegant and unique design as well. The key difference between a pergola and a pavilion lies in the roofing. Pavilions typically have a full-coverage roof that offers protection from the weather above. Because of this feature, pavilions are often the more practical option for homeowners living in unpredictable climates. Pavilions can feature a fully finished ceiling if you want the space to feel more inviting to guests. Top off the look by installing an outdoor kitchen and heating source that allows you to entertain all year round! For added convenience, outdoor retractable blinds are a valuable feature to invest in when designing your pavilion. Choosing to match the roofing of the pavilion to the roofing of your home is an easy way to create a universal design throughout your property. To find out more about how a pergola or pavilion could improve your outdoor space and learn which option is best for you, contact an experienced pergola and pavilion contracting team, like Texas Custom Exteriors.